climate, weather and midges: be prepared! Important: this survey is based on my own experiences, wishes and ideals. So don't blame me for paying no attention to dancing, golfing or fishing - these things don't have my special interest, and therefore I don't have anything valuable to say about them. Moreover, this survey is written from a Dutchman's perspective. Going to Scotland by boat and not by air makes a lot of sense to me, but if you are from Australia - well, then it is another thing. So please, keep in mind that all this is from a personal point of view. That said, I am very much interested in the experiences of others'! Feel free to share them with me. The links I made are just first pointers - there is an amazing wealth of information on the web. All in all this article might be a bit too much of a boring list, so feel free to skip what you don't like to read! Scotland is my favourite travel destination. I won't tell you why - I hope my pictures on this site show why. One thing is for sure: I feel Ceud mìle Fàilte: a hundred thousand times welcome! 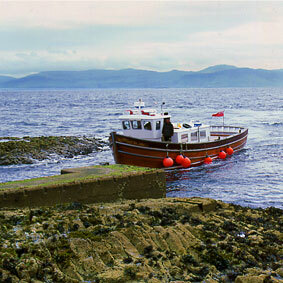 For me, there is only one way to get to Scotland: by boat. Through the Chunnel is a real detour and the romance of travelling is lost (unless the tunnel stills looks like a cave, but I suspect it doesn't). Travelling by plane doesn't fit my aim of environmental friendly living. Admittedly, I drive around Scotland by car, which is also a source of pollution. But I cannot take that car with me in the plane and so, there you are. 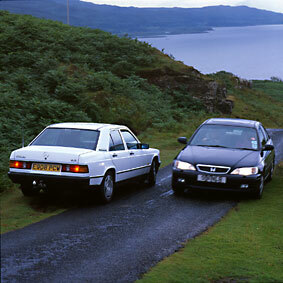 Another possibility is to hire a car in Scotland. The wheel is where it should be: at the right. The brake and gas pedals have the same order as all continental cars, but the gear handle is not in the right door. I hired a car once, and as soon as I had left Edinburgh, all went well. It is even easier to drive on the left. My favourite ferry to cross the North Sea is IJmuiden - Newcastle. 6 o'clock PM the ferry departs, you can have a nice meal, a good night of sleep and in the morning at 9.00 local time you arrive and drive in Newcastle, in the north of England. Within half an hour you leave town and drive through Northumbria to Edinburgh - or along Hadrian's wall to Carlisle and the motorway to Glasgow. Whatever way you choose, after three hours of driving one reaches the Scottish urban belt. Another hour and the Highlands are yours! There is no need though to go with great speed to the Highlands: the Lowlands (which are in no way flat) have a character of their own, with small market towns, farms, rolling hills and moors. The highways I like best are to be found in the Highlands: the single track road, with passing places. They can be found in the sparsely inhabited parts. 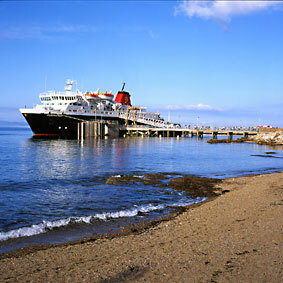 On the Isle of Mull, as an example, there are only 30 kilometres of double track and several hundreds of single track. The speed is rather low, most of time around 40mph (that is 65 kilometres an hour), the ways wind a lot and around each bend a car can loom up. Don't forget to pull in to the left! Part of the charm is to greet the one you pass in such a passing place (the one who drives on greets first, the one who stopped greets back). When you see each other too late, just drive back to a passing place - easy going! Please notice that distances are given in miles (each mile being 1609 metres). The number of miles has to be divided by 5 and multiplied by 8 to get you the right number of kilometres. And a mile happens to be 1800 yards! Height, such as for mountains, are given in feet. A foot is 0.3048 metre. To get from feet to metres, just multiply by 3 and then divide by 10. And for your information: a foot is twelve inches. And yes, indeed, three feet make a yard. At the most unexpected of places one can find petrol stations. Prices vary enormously. The further from town the more you pay. On the islands petrol can be 20% more expensive than in Glasgow or Edinburgh. Not surprising, of course, as these areas are remote and have just a few inhabitants. The number of garages is, related to the number of people, rather high. I have no experiences with emergencies, but the few visits to a local garage were very positive. The problems were fixed rapidly (ready while you wait) and for a very reasonable fee. 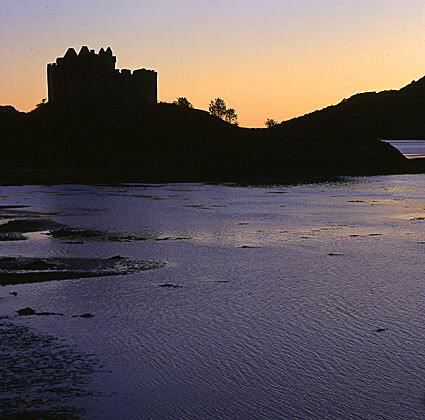 Part of a visit to Scotland should be a crossing to one of the numerous islands. Driving a car the prices are rather high, but so is the quality! And one thing: don't go to Skye by the Kyle bridge. The same amount of money lets you cross by the Glenelg ferry. More pleasant, and you can see the Glenelg brochs as well! Another recommendation would be to do a bird, seal, dolphin or whale tour. A motor vessel takes you and about 20 - 60 others to bird colonies or to seas full of wildlife. I had very good experiences with Turus Mara (Ulva Ferry) and the Iolaire of Iona for tours to Staffa and the Treshnish Isles. Bikes (ATBs) can be hired in more and more places. Even though Scotland is a mountainous country, an amazing number of roads are relatively flat because they follow the glens (that is flat compared to the mountains, and not compared to the flatness of the Netherlands!). Walking has been popular for ages. The West-Highland Way is the best known, but there are many others paths as well. The access of wilderness areas is good, but keep in mind restrictions due to deer hunting from August to October or in the lambing season in April and May. A must for walkers and cyclists are the wonderful 1:50.000 and 1:25.000 Ordnance Survey maps. There are no better ones! Never forget to take rain clothes with you. Always have boots or walking shoes. Some extra energy, in the form of chocolate or nut bars, and water are a must too. A good walk can take longer than you anticipated, and the weather can always take a turn for the worst. I like camping best, apart from winter time that is. There are several ways to camp. One is to set up your caravan or camper at a multi-star campsite with lots of other mobile homes. Or you go to a nice, small, less expensive campsite with small tents and a few caravans. The latter sites often have the best surroundings. Sometimes a green is offered for camping, often with a public convenience just around the corner. The one in Shieldaig certainly is to be recommended: a marvellous view and there is even warm water. If you feel like paying, by no means obliged, you can put some money in a box. Camping for free is possible in most places too, but mind the local rules for fires. Don't forget to bury your excrement. To stay a night (and day) outside of civilisation is very appealing to me, even when the ground is less flat and there are more midges. 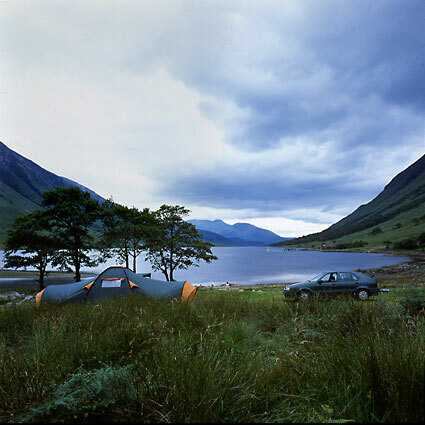 And I won't tell you that Glen Etive has many nice places, or Uisken, Isle of Mull, otherwise, everyone would go there. A more expensive accommodation, but one that gives more contact with the locals, is Bed&Breakfast. B&Bs abound, especially so in the Highlands. Families have one or more rooms for guests, with all facilities you could wish. An extensive Scottish breakfast (about which more below) is included. More costly, and as I suspect less personal, is staying in hotels. To their defence: most hotels are not that large and often situated in beautiful surroundings. For the more budget conscious there a lot of youth hostels, often along the better and lesser known hiking ways. A more recent development are the bunk houses, offering a simple shelter. A good option if you want to have more privacy are self-catering cottages and mobile homes. The level of comfort varies, as does the price. You cook for yourself (or you have a restaurant do it for you!). The minimum number of nights is often three or a week during summer. These cottages can be found in larger holiday parks or just a single one near a farm house. They are a great solution if you are out with a tent and the weather is very much against you. Contrary to common opinion on the continent, it is possible to eat in Great Britain. Even when Voltaire complained that it had forty four religions and just two kinds of sauce, you can have a great meal these days. A short list of our experiences. One of the many charms camping has to offer, is the cooking of the family's meal in much more primitive conditions than at home. The local shops have everything you might need (see below). Just put the food of your liking in the pan and eat. Sounds familiar, huh? You just have to squat down more often and don't forget to pick the grass out of your meal. If you don't want to cook yourself, there are several options. Even in the Highlands you will find fast-food and fish&chips, but both are not to be recommended. The latter offer more grease than crispiness (I am not talking about the exceptions here) and the former offer the same tasteless stuff as everywhere else on the globe. I have to add here that the Little Chefs, along the major roads, are far better than McD^$#$& and friends. Many hotels and inns offer far better bar meals, in a far better atmosphere. 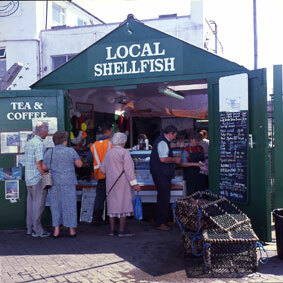 The choice of meals is not too large; often local specialities are offered. Please, leave some room for desserts like devils chocolate cake and Victoria sponge pudding! Prices are very reasonable. There are many restaurants as well, from pizza and steak to sea-food and venison. To each his own! Most of the time price lists can be seen from outside. Quite rare in the Highlands are Indian and Chinese (take-away) restaurants. They are recommendable, though. The Chinese restaurants are really different from the ones we are used to in the Netherlands, where they offer a kind of fusion of Chinese, Indonesian and old-Dutch fried rice. But wait a minute, I totally forgot to mention the start of the day: Scottish breakfast! A good beginning is half the work, as they say. It will get you till 3 pm before you think about food again! Such a breakfast is not for everyone though. You have to able to cope with, in short, several cereals, orange juice, porridge, eggs, sausages, bacon, kippers, baked beans, mushrooms, tomatoes, black pudding, tattie scones, toast, marmalade and coffee or tea. No fear though, at a B&B or hotel you can choose your breakfast's ingredients yourself, and if you camp the choice is all yours. Coffee has improved very much in recent years: it is even darker than the tea! To enjoy these teas and coffees, there are more tearooms than you could possibly visit. Also castles, museums and visitors centres provide everything a tourist, who grants himself a bit more during the holidays, may wish. There are just a few larger places in the Highlands and on the Islands. Large starts here with a population above 1000. Such places, like Oban, Fort William, Mallaig, Kyle of Lochalsh and Ullapool in the Highlands and Portree, Tobermory and Stornoway on the islands, have a large supermarket, a shop with building materials and electronic stuff, a book shop, a camping and a sailing gear shop, a video shop (comes in handy when you're camping) and everything else you can think of. If you can't find it there, you have to go to Inverness or - larger - Perth or Glasgow. The nicest way to do your shopping is in the general stores (often a Spar, Coop, Mace etc). Some boxes with vegetable, a deep-freezer, 2 metres of fridge, a few shelves with cans, newspapers, magazines, a couple of pots with Italian, Indian or Chinese food, eventually a post office and always a rack with holiday cards. Almost always the people are very nice and helpful, happy to talk for a while. Also recommended as a source of information on accommodation or places to eat. These shops are opened often around 8 to 8, sometimes even longer. Another place where you can buy things, is the local petrol station. There is less choice, but otherwise the same applies as to the general stores. A number of campsites and holiday parks sell stuff like milk, bread, eggs, crisps and other highly necessary goods. This is great, in particular if you don't have a car. Opening hours are often restricted though. Film, print and slide, can be bought at many places, but not always the ones you are used to. Batteries are hit and miss, though AA and AAA penlights can be had everywhere. I was able even to find special lithium batteries for my Pentax MZ5 in a post agency in Acharcle. I have no clue whether memory cards can be easily found. In Fort William there is a great photo store, as there is in Inverness. The larger cities have even more, of course.